Especially when it comes to contemporary church services, lighting can play an important role in the creation of engaging worship environments. Creatively and sensitively designed lighting can enhance the atmosphere of a space – working together with music, words and other visual elements such as video projections – to create a worshipful setting that draws in worshippers and directs them towards God. 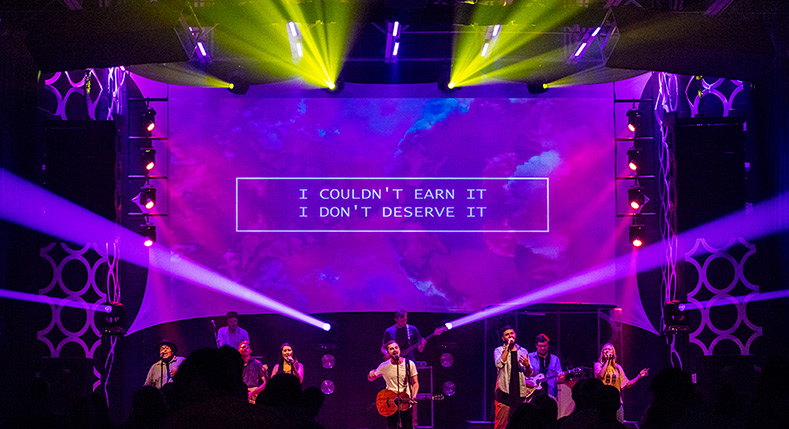 It was for this reason that Covenant United Methodist Church recently invested in a series of progressive upgrades to the lighting system in their contemporary worship space. Based in Dothan, Alabama, Covenant United Methodist Church has a membership of over 2000 and offers three worship services each Sunday. The first two – one more traditional and one more contemporary – are hosted in the church’s large main sanctuary, while the third is a cutting-edge worship experience called ‘Collide’ which takes place in the church’s converted on-campus gym. The visual aesthetics of this gathering are considered extremely important and services are live-streamed online, which gives another reason to ensure good illumination, therefore the church recently decided to upgrade the venue’s lighting system. The church gym is also used for one-off concerts and other special events and therefore has been setup with a stage and AV system for many years. However the lighting system was becoming dated, so the church reached out to Dave Guiler and his company Premiere Entertainment Group for advice on upgrading the space’s lighting equipment. After starting out as a DJ business 16 years ago, Premiere now offers event production as well as sound, lighting and video installation services, specializing in churches and church events. Having visited Covenant, and gained an understanding of their current setup and what they hoped to achieve, Dave suggested a rolling program of lighting upgrades that could be carried out over a series of stages as and when finances became available. The first of these to be carried out was the installation of 10 ADJ Mega Bar RGBA linear LED fixtures that were fixed to the roof of the venue above the stage. Each 42-inch bar packs in 320 10mm red, green, blue and amber LEDs to produce a wide, even wash of light across an extremely diverse palette of colors. At Covenant, they provide a vibrant down washing of the stage and set, which provides a base look from which the other fixtures that were installed later can be used to build upon. The next phase of the lighting upgrade involved adding in moving head wash fixtures to enhance the stage with movement and energy. Dave supplied eight of ADJ’s Inno Color Beam Z7 LED-powered wash fixtures that feature motorized zoom with a wide variable beam angle of between 10 and 60-degrees. These were arranged in two stacks of four, rigged to hanging ladder-style mounting bars positioned at either side of a large central projection screen. The final stage in the upgrade process was the replacement of existing outdated moving head profile fixtures with ADJ’s versatile Vizi BSW 300 hybrid beam, spot and wash model. Dave supplied a total of eight fixtures, installing four flown from the roof above the projection screen and mounting the others on existing truss plinths behind the band. This means that the screen is now surrounded by four moving heads on each side, allowing for the creation of a wide variety of engaging stage looks as well as aerial effects and GOBO projections. Power was another important consideration across the whole project, as the Covenant Gym only has a limited electrical supply. The use of all LED-powered fixtures from ADJ meant that an impressive lightshow could be created without overloading the fuse boards and also has the added advantage that the installation is essentially maintenance-free with no need for lamp replacements as with older fixtures that used halogen-based light sources. The difference the new lighting system has made to the weekly Collide services is significant. It is not only brighter and punchier than what they had before, but it has provided the technical team with a much wider toolbox of effects to use to complement and enhance different songs and worship activities. 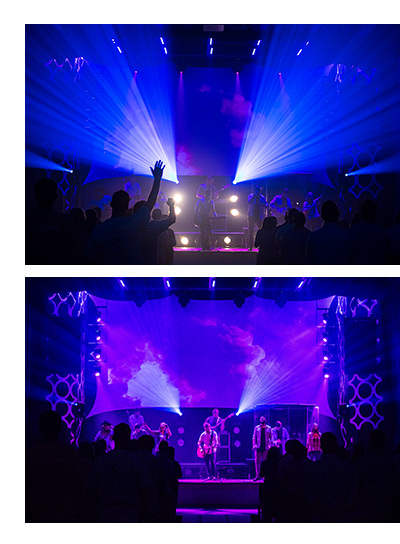 The combination of the vibrant static washes from the Mega Bar RGBAs, dynamic washes and beams from the Vizi Inno Color Beam Z7s and the versatile spot, wash and beam projections from the Vizi BSW 300s combine to create a compact, yet impactful and truly versatile lighting system that enhances the worship experience for this dynamic congregation.